yoshimi the flying squirrel: Vogue 2900, June 2016.
pattern: V2900, style A (straight grain version) from Vogue Patterns. Lengthened by 10cm for a fuller skirt. I tried pattern matching of the pieces and it was a light nightmare. fabric: Summer wool, plain woven, thin and smooth, dry, slightly stretch-y and lovely. I hope you have a good summer and find time to sew!!! Thank you, Gillian!! I hope you have a good summer too! It's a beautiful dress Yoshimi, I hope you get the time to make some more soon. Still here! Nice summer dress! I'm glad you're here, Jen! Thank you! I agree with the others, a really beautiful dress, very feminine. It is nice to see you back but like you I too am having a bit of a hiatus, a bit with sewing but mostly blogging, but I do love to read others. Have a really lovely Summer, ours is a bit wet and soggy at the moment! Hi Maureen, thank you for your comment. Yay for having a happy hiatus, for both of us!! I hope your Summer is going be better and brighter! Hi Yoshimi, so nice to see you back. 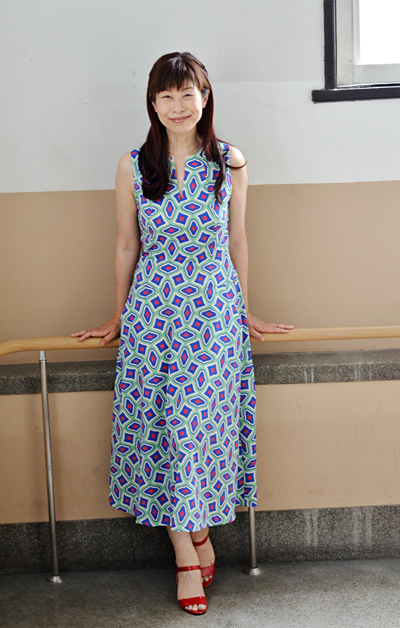 I love your oretty dress:) Hope you have a time to sew in summer. Thank you for your comment, Hana! I always love your posts, so I thank you for blogging too! Lovely! I saw your dress on Instagram and am happy to be able to click to the pattern here. I really like your longer length. Thank you, Jenny! It is a very useful pattern that you can use for many kind of fabrics. Though it wasn't showed nicely in the pictures, the fabric I used was a rather formal summer wool and it was a great match for the pattern. Very pretty dress! I go through phases too! Just finished 2 failed projects so I'm not very motivated right now. Thank you, Jenny! Let's hope we get nice winds for the victory very soon. I like all your versions of V2900. This one is beautiful, too. Gorgeous as always! Hopefully sewing time will return soon! Thank you, Margo! I love your new jeans, you look pretty in them, as always! Is this your 3. Vogue 2900???? Very pretty! Have a great summer! Thank you, E, I hope you have a great summer too! This is beautiful! And you look lovely in it. Have a lovely summer! Thank you, Gretchen! You're so sweet! Thank you, Carolyn! Things around us are getting better these days and I am very happy about it. I hope you're having a happy winter too! So lovely and like the way you paired the dress with cute little red shoes. You and the dress look wonderful! It is good to hear from you, yoshimi! Just post when you want and we'll be here to read it. That dress is beautiful! Thank you for the kind comment. You're so sweet!! So lovely to see your smiling face and your beautiful new dress! Thank you, Maya! I hope you a great summer too. BTW I love your blog and your beautiful garments very much!! beautiful, feminine dress, I love it. Very nice. Thank you. I'm looking forward to seeing more. It's a gorgeous dress and sometimes we just need to step away and take a creative break. Enjoy yours! Ah, so good to see that you are well! I bought this pattern admiring it on you but haven't sewn it yet. Maybe never, but it's there! I have long breaks between sewing, too. It seems that I have to find a need to sew before it starts up again. Right now it's nightgowns as I can't find ready made that satisfy my needs, too sheer, too thick, whatever. Best part is that I get to use cotton florals that look too old fashioned for day wear. Love wearing them! Ah nice to see you back! What a beautiful dress! I hope you enjoy your summer! We are here and love to see and hear from you! Such style and grace. It is always a joy to read what you have to share. And see your beautiful creations. You and our friend Carolyn are inspiring. Thank you for your comments! !